The Copyright date in the footer reads 2011, but the student exhibits were curated and produced as early as 2002, which is evident by the use of animated GIFs, table code and font tags from that era of web development. As such, it would have been a remarkably ambitious project in its day, even with assistance from the Manitoba Association for Computing Educators. The Virtual Museum exhibit itself is very engaging, with a well designed interface that follows through with a history of the Crafts Guild of Manitoba, an exploration of the collection held by the Manitoba Crafts Museum and Library, a demonstration section featuring video of various stitching, knotting and braiding techniques — and a Memories section containing sound clips and recollections from eight members of the Crafts Guild of Manitoba. You can tell from the student exhibits, they had some fun — and definitely learned about the multicultural heritage of Canada, while also contributing to the interpretation of history through digital preservation. Photos of the classroom activities are sprinkled throughout the presentations, giving encouragement for teachers everywhere to use the lesson plans provided to help develop our budding new artisans of the future! 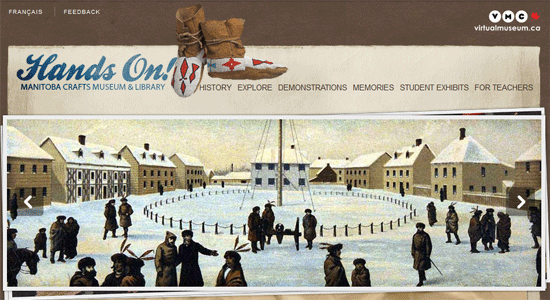 This is a great trend for the Virtual Museum of Canada. Hiring professionals to produce a digital archive of any subject will always be necessary — but handing over a ‘Hands On’ exhibit opportunity to the target audience themselves — is a very nice touch indeed.